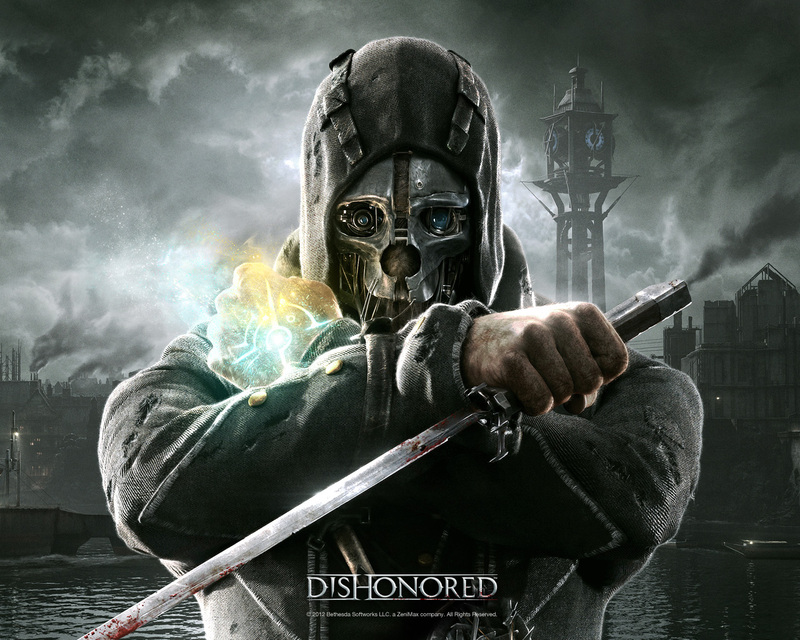 You didn't think we'd let Dishonored sneak by without talking about it, did you? This week, we dedicate an entire episode to the game. It's dense in the most positive sense: with multiple solutions to even the most mundane obstacles, an open-ended upgrde system, and a surprisingly massive (albeit hidden) amount of lore, everyone's playthrough will be slightly different. For example, one of us was an unassuming (and slightly bumbling) assassin, while the other was a terrifying rat lord. As always, feel free to weigh in with your thoughts in the comments! The Boyle's mission was actually quite fun this way. Corvo seduced the correct sister (already knew who the target was by that point) and choked her upstairs. Brought her to the basement without being noticed and then met the servants in the basement (the only friggin' time I wasn't using darkvision, I swear it's like detective mode from Arkham Asylum). I obviously panicked, but I slowed time, threw the red Boyle aside and metodically choked each maid. Piled the bodies and waited for a good fifteen minutes to see who came downstairs. That basement became like the classic horror film basement, no one who opened the door ever got out. were you two not at all surprised by the Outsider's physical appearance? For some reason seeing the equivalent of a chthonic deity look like a thirty-something was quite a surprise given the madman graffiti on the prison walls (the outsider walks among us), I definitely expected something akin to Lovecraft's creations. Or maybe it was slightly jarring to my expectations because I wouldn't imagine an "Outsider" of the physical realm looking like a human. It does fit with the lore if you look at it from a "he was a normal guy once" point of view, and I hope the DLCs will expand on his mythos, as I found him one of the most intriguing characters of the game. I wish more games would pay attention to their theogony. On a side note (I guess kinda really minor spoilers): I do think there was one well developed character at least, Emily. I wasn't really surprised by The Outsider, but I was spoiled early with some footage of him before I played. His personification actually spoiled some of his mysticism for me. It's hard to take an elder-god seriously when he's sporting a 5 o'clock shadow. I also enjoy Emily's transformation, although my murderous ways made her a little sadistic. I also liked her caregiver. of course most of the information is just picked up from side conversations and the heart. But I did "get" their motivations. Did someone say, "Rats?" http://monsterkillers.com/games/2012-07-18%20Rat%20Chaos/ratchaos.html! I am both intrigued and terrified. I had kinda gotten a read that The Outsider and the way he presents himself to be something like Lovecraft's Nyarlathotep? The body we see isn't actually what The Outsider is. I agree about Emily being an interesting character, and interesting how she manages to be someone who is still learning about the world and political-life, and so is sometimes making mistakes, but sometimes surprisingly capable. . When she drew the picture of Corvo for you, did either of yours have the label "Daddy" at the top of it? Mine did, and it explained a few things about acting choices in other scenes. Also thought it was extremely cool how the heart drops hints about who's heart it is. My picture also had the "Daddy" on top of it, which pretty much cemented my guess as to the heart's origin. After I finished the game I started reading and listening to other people's experience and apparently the heart drops a lot of hints, especially if you use it in the Daud fight. The game is just so packed with stuff. The idea that other folks experienced entire swaths of story that I just walked by is just so impressive. As for the Outsider, I assumed he just took whatever shape pleased him/suited his purpose. Since he was a 30-something, athletic looking dude, I figured it was because he was trying to emulate/screw with Corvo. He was showing Corvo a mirror of his potential, should he embrace the Outsider's path. When it comes to readability issues, how do you feel Dishonored compares to Mirror's Edge? A common problem I experienced with the latter was not being able to accurately judge distances, or whether certain objects could be climbed onto or not. The "Runner Vision" was only inconsistently helpful in that regard. Also did you play on 360\PS3 or PC? I know some people who played on the former found Blink a lot harder to use as it would snap to geometry; especially the edge of grates if you were trying to climb up through them. I think the Mirror's Edge comparison is quite relevant, as the movement and climbing felt very similar to me. In Dishonored, I actually had more trouble judging vertical distances and was routinely surprised by how high I could jump and then scramble up something. Thankfully, this meant that "mistakes" usually came out in my favor, as desperate jumps actually worked out instead of sending me to my death. Then again, I'm on record as actually having liked Mirror's Edge's platforming, so who am I to judge? I played on console and Jorge played on PC, so we were able to compare experiences a bit. I didn't mind blink all that much; when I did make mistakes it was largely because of misjudging distance rather than the cursor getting stuck to the wrong thing. I actually think the controller set up might be useful for doing more complicated jump/blink combinations, since everything is mapped more compactly. However, with the right button mapping/gaming mouse, I'm sure a similar effect could be achieved on the PC. As for the story, I think I actually like it more now, after a little time to reflect. I admire how much detail they put into the back story, even if most players will blow right by it. Basically, they made everything opt-in, which I suppose is the safest way to try to please the most people. As to the BioShock comparison, I think the "If you remove ______, it's a pretty cliche story," line of reasoning can be a bit of a slippery slope, since many of the most respected works of art are very basic stories with interesting details (just ask Shakespeare). However, I see where you're coming from and I do think Dishonored's story stacks up well. I feel like the social stratification in Dunwall gets more attention, as do the social/cultural beliefs of the people (I loved hearing about the citizens that hid the old folk religions from the overseers). That being said, BioShock's objectivist angle is still very powerful in a meta-textual sense, as it was commenting on the way we actually engage with the medium. Andrew Ryan wasn't just talking to Jack, he was talking to the player and pointing out that, in almost every game we play, we're totally fine with following orders and making self-interested choices. So I guess I'd say Dishonored might have a stronger fictional universe, but BioShock might have the upper hand when it comes to making an artistic statement.